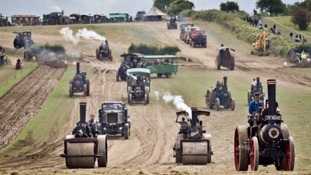 A network of roads is to be built on the site of the Great Dorset Steam Fair to stop bad weather disrupting the event. Last year, tractors were brought in to tow vehicles and there were long queues for the site at Tarrant Hinton near Blandford Forum. Some displays had to be cancelled. Organisers are planning to change the layout and are applying for permission for more than three miles of permanent roads.